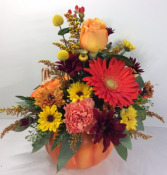 Send this stunning, bright fall vase arrangement for any occasion and amaze that special someone! 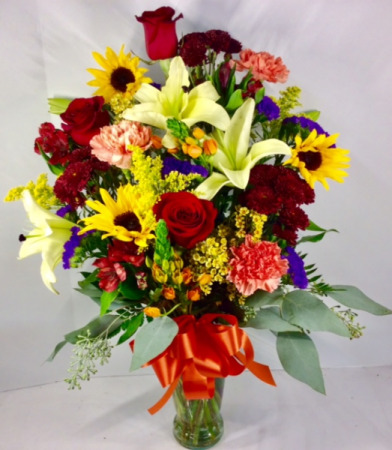 It has sunflowers, lilies, roses, carnations, mums, alstroemeria, star of bethlahem and mixed filler flowers. It is finished off with a complimentary satin bow. 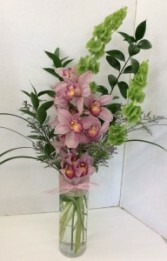 A beautiful stem of cymbidium orchids nestled between bells of Ireland, limonium, ruscus and lily grass. 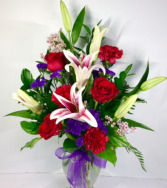 Comes in a 10.5" glass cylinder with sparkle ribbon to coordinate with the beautiful orchid inside.